Nicolas Palazzo is the new HIAS Border Fellow working in El Paso, Texas. Last week more than 20 rabbis, cantors, and activists went to the U.S. -Mexico border in a human rights delegation led by HIAS and T’ruah, the rabbinic human rights organization. 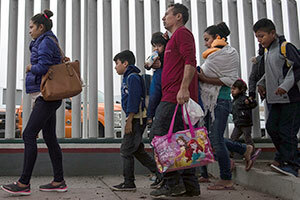 Department of Homeland Security Secretary Kirstjen Nielsen today defended the Trump Administration’s declaration of a national emergency at the Southern border and asked for changes in laws regarding the process of asylum seekers into the United States.